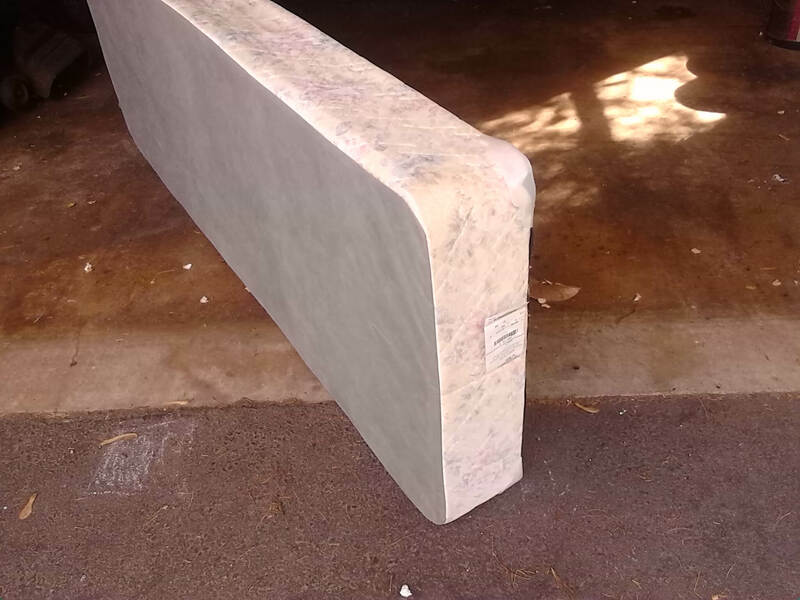 Have you ever wondered what's inside that boxspring the bed companies sell you to put under your mattress? Some mattress companies even make you buy one or threaten to discontinue your mattress warranty. Well, we're going to find out what's inside... just for fun, we're going to rip apart this perfectly good boxspring just to see what it's made of (because we're crazy like that). 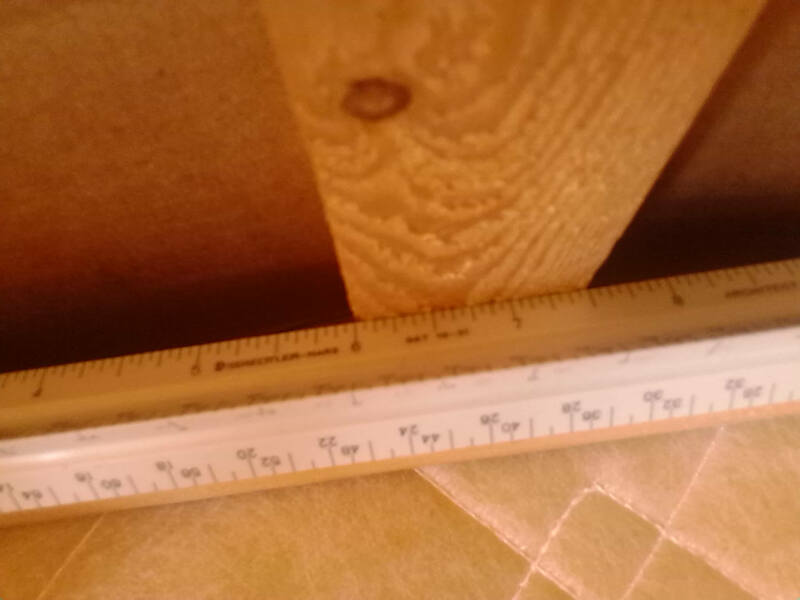 As it turns out, there's just a few small 1.5" wide wood slats covered by thin cloth and cardboard. 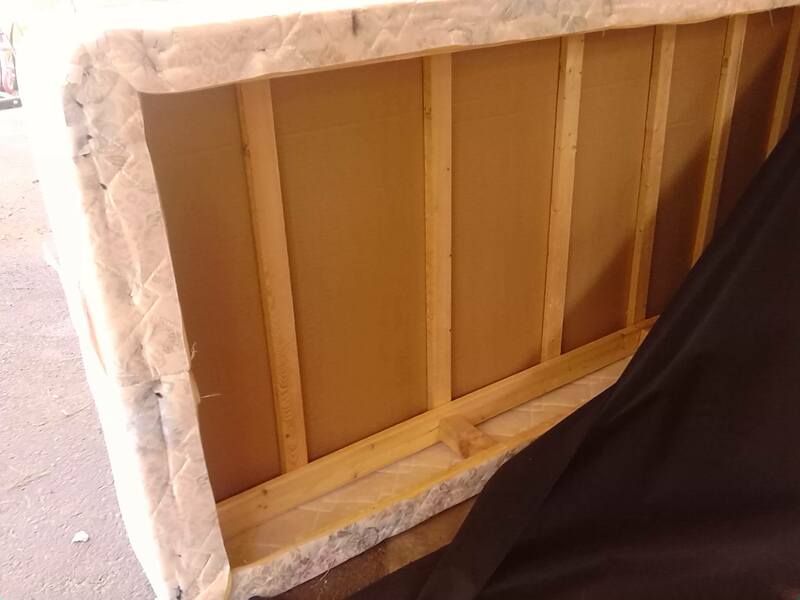 This is what's supposed to protect your mattress from sagging. If it looks fairly unsubstantial, well, it is! Why bother paying extra for a cheap boxspring when our beds support the mattress even better? We use wide slats, and more of them, to protect your mattress investment for the long haul. No boxspring required! 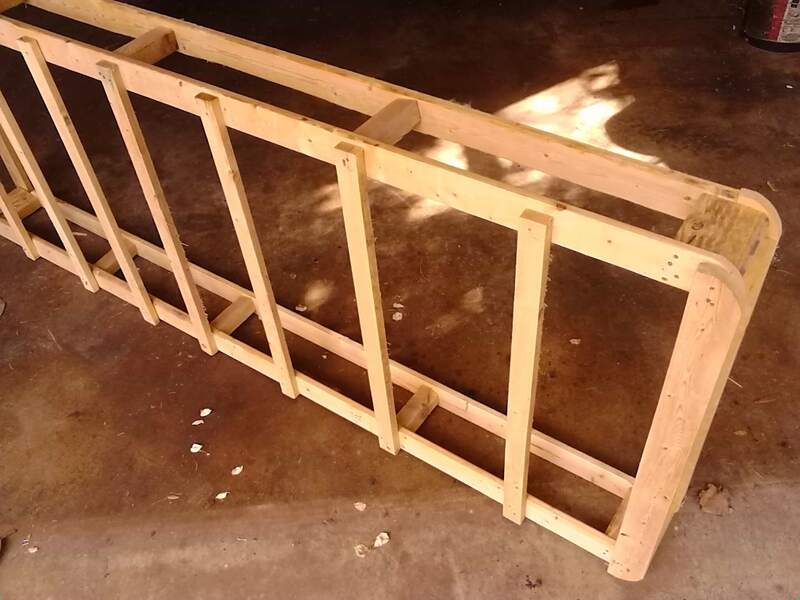 Our bed frames use no plastic parts, or cheap mass produced weaknesses. A chain is only as strong as it's weakest link. 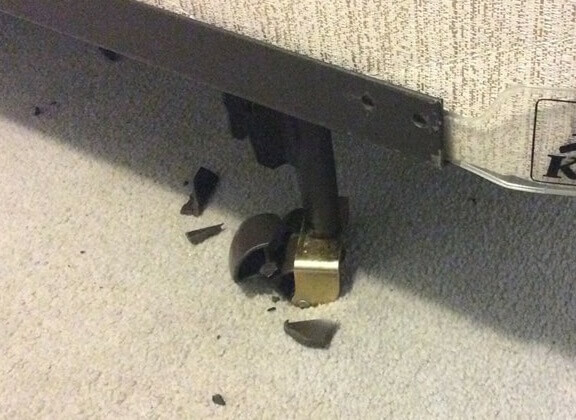 The bed shown below has a strong, stiff, and expensive metal frame, but sits on cheap plastic wheels that can weaken over time and eventually break. This frame is riveted together and there is no easy or cheap way to fix this issue. Don't let this happen to you! Our bed frames are structurally designed around the hard use of kids. They have gone through extensive testing involving weight testing, jumping, tantrums, and almost literally anything your child can throw at them. Whatever bed design you buy from us, rest assured that each piece is either handmade or purchased with structural integrity in mind! This article was written by our Customer Service specialist Nicole about her own experience, who in addition is also married to one of the owners. This article has also been featured on adorethem.com as well as other websites. I am now heavily pregnant with a very active toddler. The idea of getting her potty trained before the baby arrives has long been thrown out the window (anyone else with me on the horrors of potty training?!?!). But we still needed a solution to changing sleeping arrangements. For those of you who have been pregnant, you know that those last few weeks can be highly emotional. For me, it was constant worry about how baby number two would affect our sweet little Lily. I was petrified she would feel pushed aside, second best, etc. My biggest fear was that taking her from her crib—the only place she had ever slept—would make her feel even more displaced. At this point I should mention that our Lily slept through the night at five weeks... 8 pm to 7 am. We knew how lucky we were and also knew that odds were that it would probably not happen again. With a newborn coming shortly, sleepless nights were imminent... especially if we were fighting with a toddler to stay in her bed. 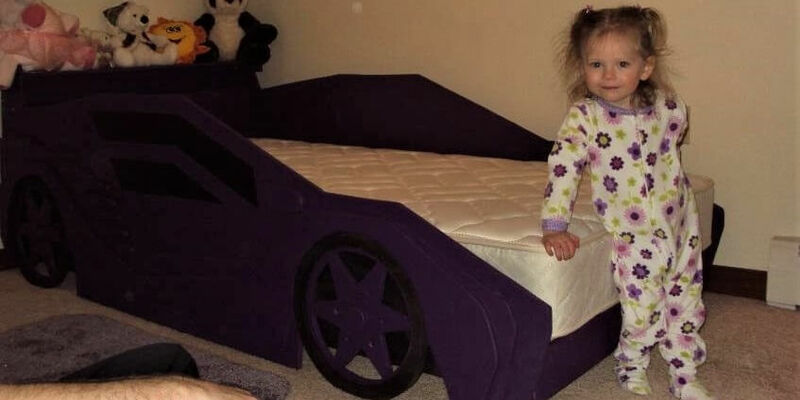 To make matters more difficult, our daughter decided she wanted a purple race car bed. Nothing else would do. 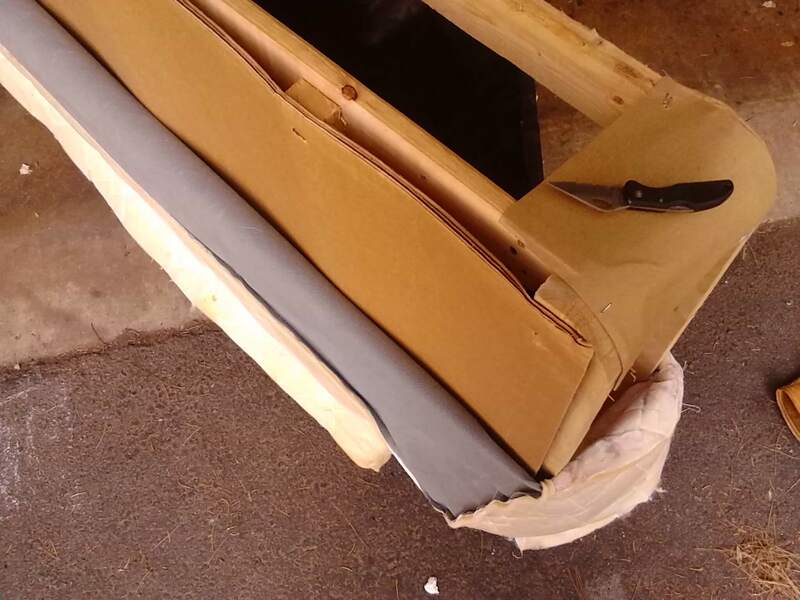 There were no affordable, well-built, non-plastic options of race car beds for a twin mattress, and none of the options let the buyer choose a purple color! We just had to get a purple race car bed for Lily! My husband is handy guy. He knows how to fix anything and if he doesn’t know, he will teach himself. He was a CADD designer by trade so he sat down and drafted plans for a purple race car bed for our Lily. He made the bed low to the ground, with high sides for safety. It was gorgeous; our daughter loved it. She loved it so much that going to bed was a treat because she could drive off to dreamland. She never attempted to get out; she never fought us about going to bed. Even better? She didn’t want anything to do with her baby sibling’s crib because she was officially a big girl! With a few weeks left in my pregnancy we had not only accomplished getting Lily into her big girl bed and sleeping through the night, but the transition process made her feel special. She didn’t feel uprooted from her crib; she didn’t feel displaced by baby. It was a double win for us! Everyone who saw the bed loved it. They loved the design, loved how it made the transition from crib to bed fun and special. Our friends and co-workers told my husband he needed to make these beds for other people, and that he should market this to other parents in situations just like us. So it turns out that first bed, designed and made out of love for our Lily, became the prototype for the beds made by Tradecraft Specialties. Since then, we have added construction vehicles, aviation themed beds, monster trucks, even surfer beds! And if our customers don’t see what they want, we will custom design just about anything! Over the last few years, we have heard from parents all over the country about how great our designs are. Durable but practical, fun but also safe. As one mom said recently, “I was dreading transitioning my 2 ½ year old son but of his crib to a big boy bed, but after purchasing an airplane bed from Tradecraft Specialties, all my fears have been put aside.” Because after all--a child needs space to dream! Lily with her brand new race car bed at 23 months old!